Real estate addendum forms are used by property landlords, owners, tenants, and brokers to inform the other involved parties of a real estate contract about the amendments and changes to be observed. However, the party who plan to suggest the alterations and additions in the contract should first negotiate with the other parties to ensure that an agreement will be achieved and that conflicts will be avoided. 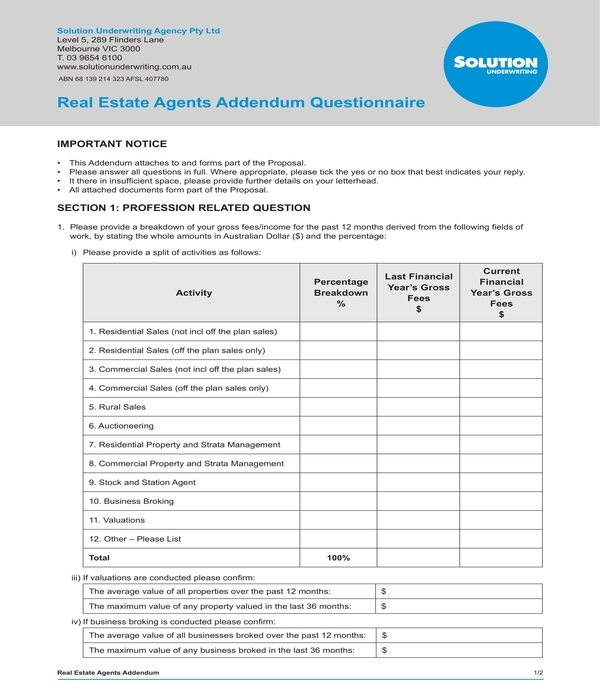 Real Estate Agents Addendum Questionnaire Form – Real estate agents who have signed an insurance proposal with an insurance company will be the users of this form variety. Basically, the main purpose of a real estate agents addendum questionnaire form is to document and acknowledge the agent’s financial gross from the activities that he participated in the past years prior to the day of signing the proposal. In order to complete, the form, the agent must disclose the percentage breakdown of his gross fees and income along with the actual amount of his last year’s gross fees and his current financial gross fees. On the other hand, the agent will also have to affix his signature on the allotted area of the second section which is for the insurance proposal declaration. 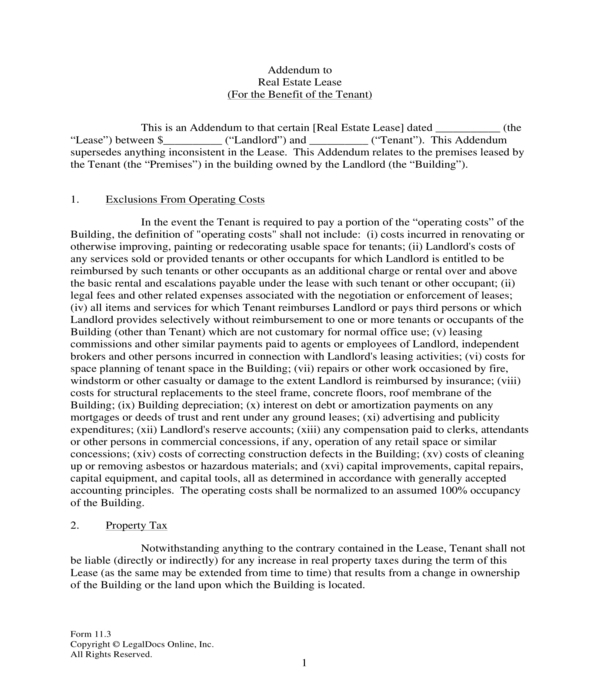 Real Estate Lease Addendum Form – Giving and documenting the protections and benefits of the tenant leasing in a real estate property is the purpose of a real estate lease addendum form. The format of the form is identical to general lease agreements which indicates the name of the involved parties in the first portion of the form. The succeeding contents of the form are intended to explain the operating costs exclusions, property tax and auditing, the property’s building condition, the landlord’s compliance, as well as the decisions of the landlord regarding space expansions and other uses of the property. Real Estate New Property Construction Addendum Form – If there are other subjects to be discussed and must be negotiated to other parties of a construction project, then a real estate new property construction addendum form must be created. 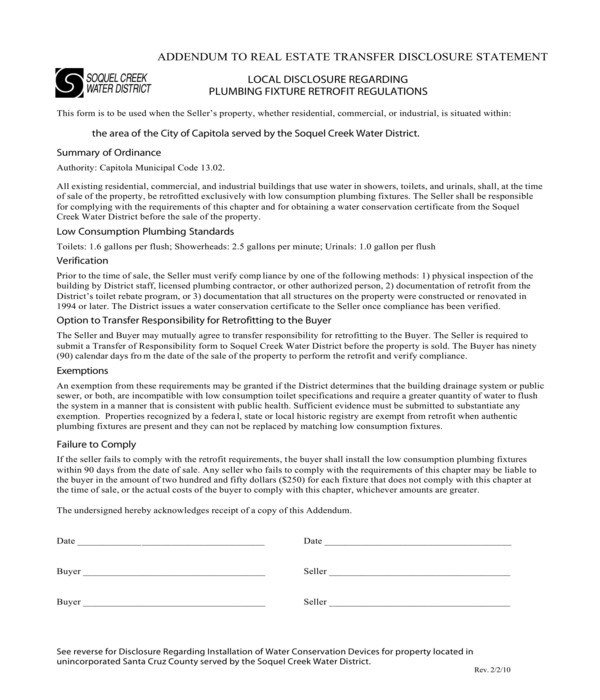 This document will enlist the additional improvements and plans desired by the buyer of the real estate property along with the additional responsibilities that each party must comply in the duration of the signed construction contract. Moreover, the updated warranties, purchase price, building security deposit amount, and inspection obligations are also included in the form to document what had been agreed by all parties in lieu of the previously signed contract. Real Estate Pet Addendum Form – Some property owners do not accept tenants who own pets and animals due to the danger and the possible damage that the pet can cause. However, if pets are allowed in the property, a tenant should be responsible enough to leash the pet or yet keep the pet away from the other residents who may have allergies or are not pet-lovers. 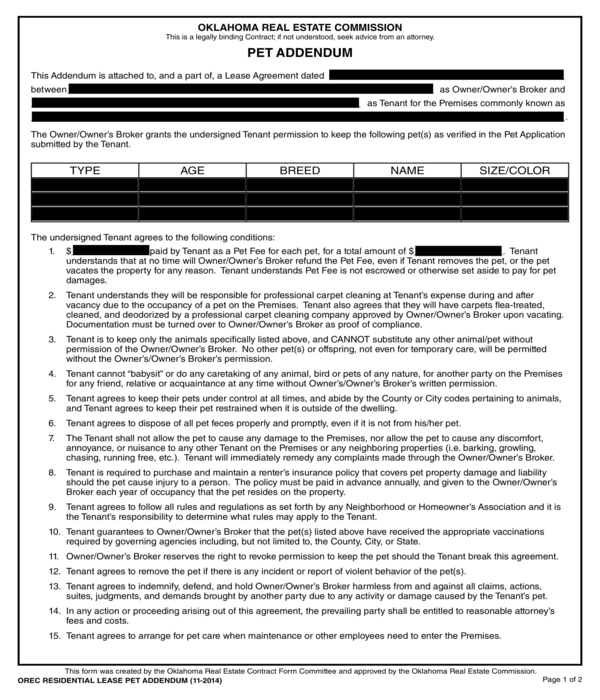 To document a tenant’s understanding about the rules and regulations in keeping pets and animals in the premises of a property, a real estate pet addendum form should be signed by both the tenant and the property owner or landlord. In the form, the tenant will have to state the description of his pet while the landlord will state the amount to be paid for the pet fee. Real Estate Property Inspection Notice and Addendum Form – Property inspections are essential to be conducted especially for properties which are nearing its closing or foreclosure. 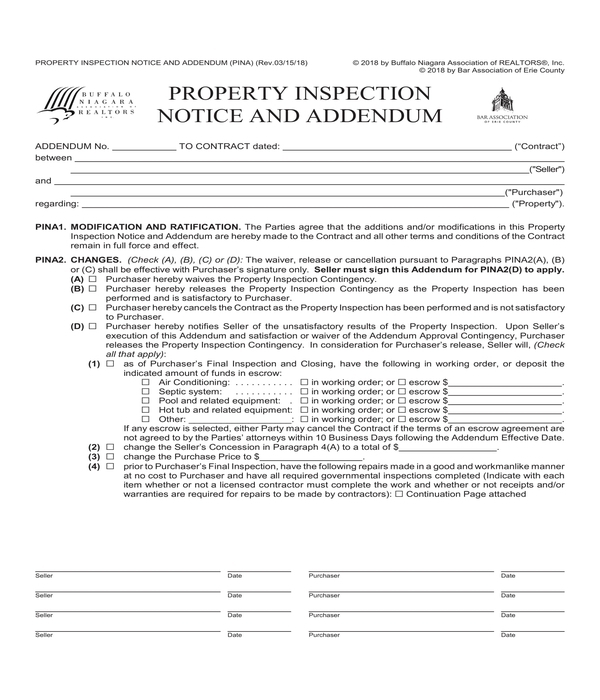 With this, a real estate property inspection notice and addendum form can be used by the property owner and buyer to document the modifications, ratifications, and the changes to be observed. 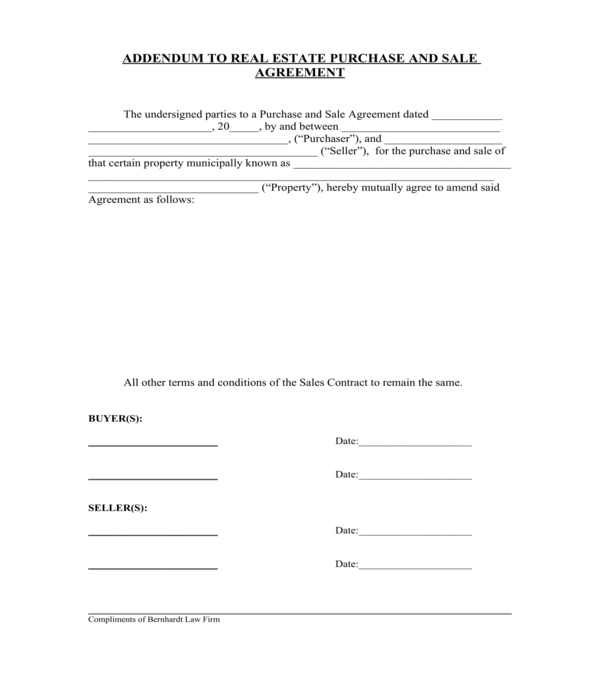 Real Estate Purchase Agreement Addendum Form – The buyer, seller, the listing and selling agents will need to affix their signatures in this form variety to indicate their approval of the changes and amendments. To use the form, the party who suggested the amendments will simply have to state the amendments with its details in the allotted area. 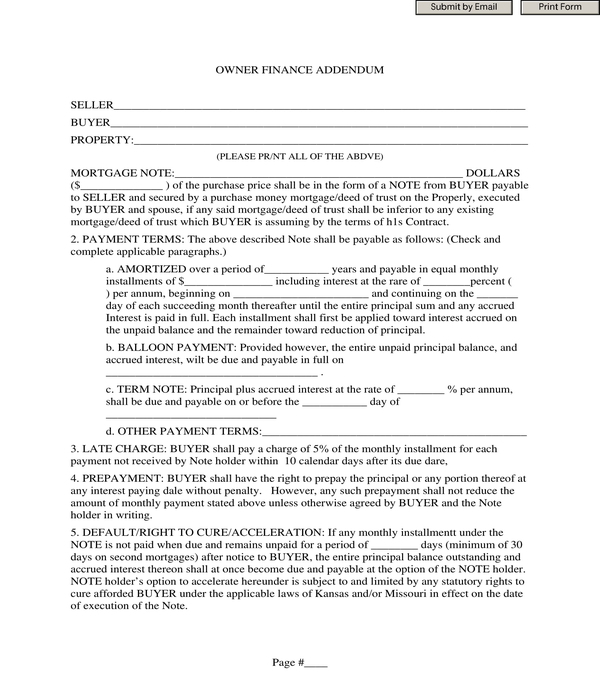 In the event that the statements of the suggesting party could not fit in the allotted area, then an additional document sheet should be enclosed with the form to further explain the necessity of the amendments and the benefits that it can provide to all parties involved in the real estate purchase transaction. 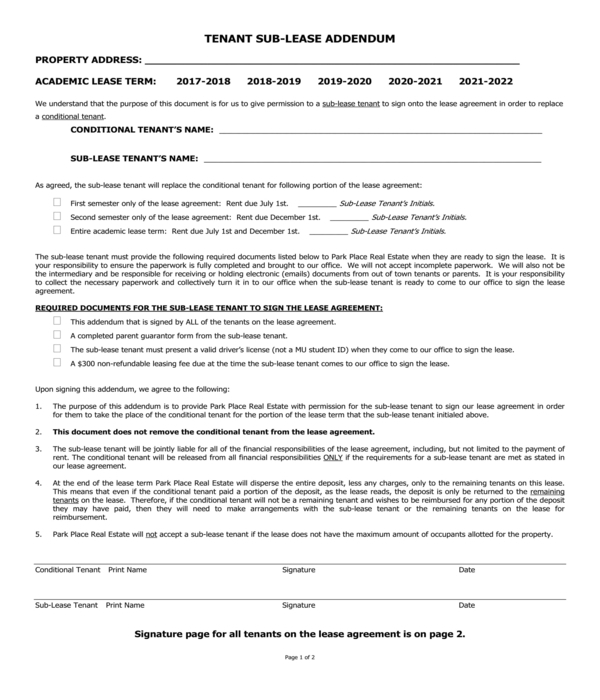 Moreover, the location or address of the property and the date when the real estate purchase agreement addendum form was used will also have to be stated. 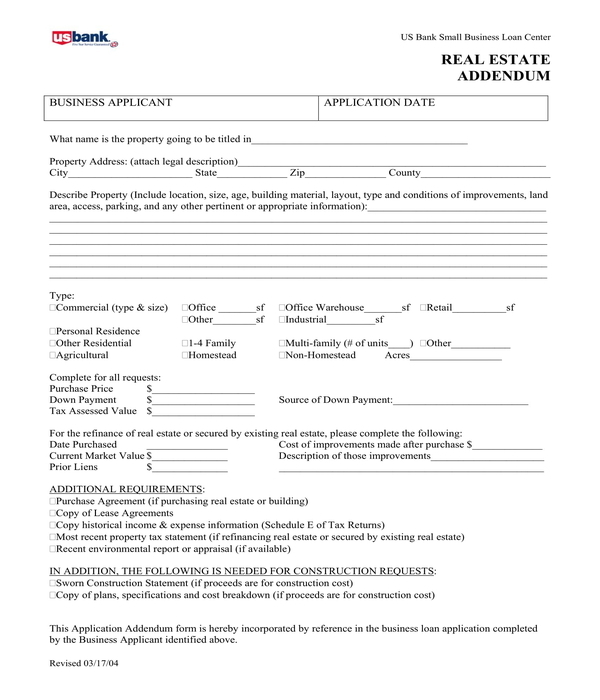 Real Estate Rental Application Advance Payment Addendum Form – This form is suitable to be used by landlords and property owners who have decided to mandate the tenant to pay rental application fees and payments in advance. In the form, the address of the property, the name of the one who is filing the application, the name of the landlord, and the date when the rental application was filed will be stated. Additionally, the amended amounts for the application fee, security deposit, rent, and the added terms regarding payment refunds and liquidated damages will also be included. And in order to complete the form, the applicant, the co-signers, the landlord, and the leasing agent must sign the form. 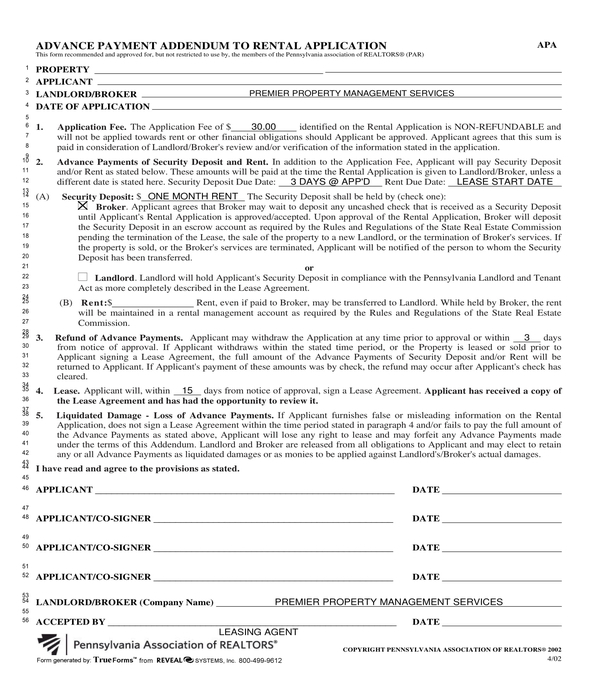 Real Estate Tenant Sub-Lease Addendum Form – The user of this form is a tenant who has subleased the rented property to another tenant. The form will document the added terms and conditions of the previous sublease agreement specifically the period of the sublease and the information of the subleasing tenant. 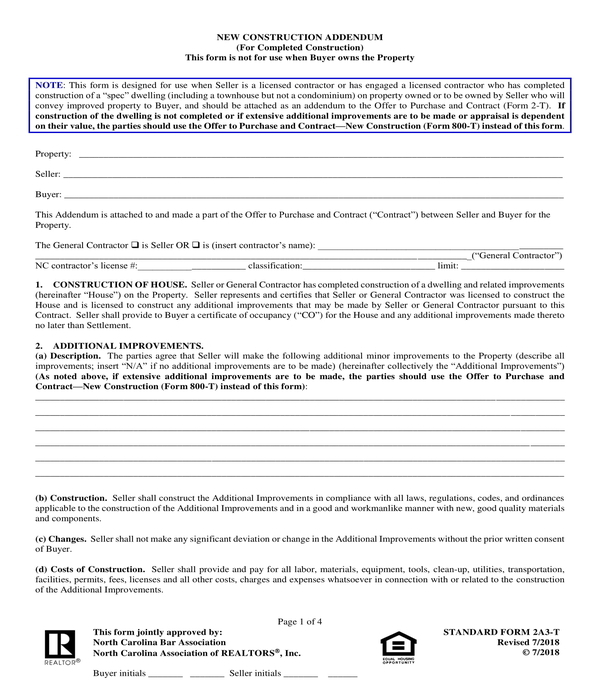 Why Are Real Estate Addendum Forms Important? Real estate addendum forms are important because it is for documenting the changes which will have to be agreed by all the concerning parties. In addition, addendum forms can also be used for nullifying sections or specific portions of the previously signed contract forms and agreements. Every party must be informed about the nullified portions to ensure that issues will not arise in the duration of the contract’s term. 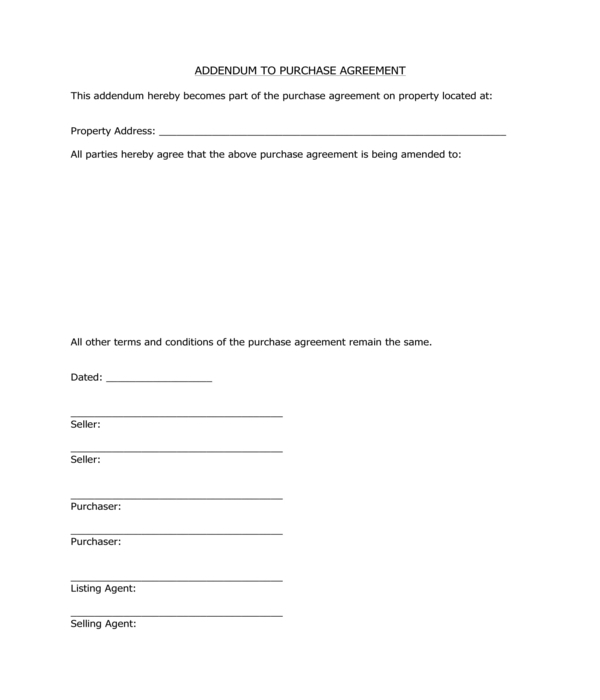 And lastly, addendum forms also clarify concerns and can be used for enlisting resolutions for prevailing issues in a property rent or sale transaction.